Most homes have double glazing windows and doors because they offer better insulation, are considered energy-efficient, and can minimise noise. However, they’re not easy to repair because of their construction. Double glazed windows consist of two window panels of glass fitted into one frame with air or gas filled in the gap between them. All repairs require expert skill and experience to fix and we at AC Joinery can help. Misted Glass – The double glazed panel can develop mistiness or fogginess if there’s a leak in the seal around the glass. This allows moisture-laden air to seep into the gap between the individual panes and that can create that misted glass effect. This compromises the beauty and the functionality of the window. Our expert repairmen will remove the lingering moisture and reseal the panel to fix the leak. Broken Glass – Double glazed glass panels are quite resilient but they’re not unbreakable. In fact, broken glass is one of the most common double glazing repairs we do. We’ll carefully remove the panes and install the replacement before we reseal the windows. This would restore the beauty and utility of the window. 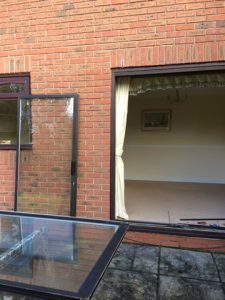 Broken Hinges – Hinges are one of the most important aspects of a window because they are required to open and close the door securely. If the hinges are broken or have malfunctioned, you’ll have to keep the window closed at all times. We can repair or replace broken hinges to ensure your window operates smoothly. Adjustments – If your window doesn’t open or close smoothly, there’s a problem with the alignment of the system. Our repair person will balance the hinges, adjust the frames, and make other such adjustments to restore its smooth operation. Draughts – If the double glazed panel isn’t property sealed, cold air can seep in and cause draughts. We will carefully examine the window and seal any leaks we find to ensure it provides proper insulation once again. We can also handle other repairs like handles or lock malfunction and patio door rollers replacement. 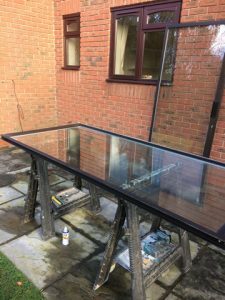 If you want to know more about our double glazing repairs here at AC Joinery, don’t hesitate to get in touch with us. You can call us at 0161 980 7992 or contact us through our web form today.